In this photography/Photoshop tutorial I show you how to photograph a levitating/floating banana. Just gotta put your camera on a tripod, use manual mode, and take two pictures (one with the banana in the frame and one without) with the same aperture, ISO, shutter speed, and white balance for each photo. Then just stack them on top of each other as layers, erase the skewer with a layer mask and BAM! You got yourself a floating banana. 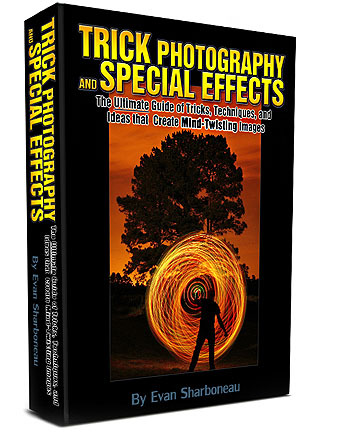 And remember, if you are into this type of photography, you'll love my Trick Photography and Special Effects e-book (and soon to be DVD / online video course). Very good , thank you very much. u the best. i watch your videos, and come on your website all the time… But that video was highly irritating. Please, stick to making real, normal videos. If that was the first video i had seen, i would never be back on your site again. Just for future reference. What photo editor you use? Your tutorials are very good 🙂 especially the steel wool spinning! Nobody realized who you were fooling? He know fooootooooo, he thinks. good day sir,please i kind of find it difficult to create a flying banana of ma own.can you please tell me how to download the eraser tool.i love your works and i will b very glad to make one of ma own.THANKS AND GOD BLESS YOU. what type of photoshop program do you use? Damgood job I read the comments. Elsewise I’d NEVER have returned to this site. I was tempted to cut it short B4 the end. hahahaha i think imma try this one…. just that the voice is annoyingly funny hahaha! thanks for the simple photoshop trick! please send or publish the psd files. the final one so that i can just use the banana. i live in South Africa, it will be an honor to tell you my bit of a story through your personal email. Please inbox me. i hope to find kindness in your heart and reply as soon as you get this. One fact is, i love your work on every level. A really simple one here! But nevertheless it turned out really well. Wow, i had to put that on mute it was so annoying.